The first week of December marks for many Lexington families the start of traditions that typically involve securing a tree to trim, hanging some lights, adding a wreath or two, and settling in to enjoy the festive atmosphere with close family and friends. But for those homeowners lucky enough to be inducted into the Holiday House Hall of Fame, the first week of December means stepping aside to let a league of ladies descend, decorate, and, finally, march hordes of strangers through each room to admire their handiwork. Every year since 1960, one local family has agreed to let their home be the site of the Charity League of Lexington’s signature fundraiser, which draws hundreds of visitors from across Davidson County and generates enough money to support a year’s worth of charitable outreach geared toward children. This year on Dec. 5 and 6, Lexington Mayor Newell Clark will join the ranks of past hosts, opening his Colonial Revival-style home on West Third Avenue to the public for the 55th annual Holiday House. Across the street at the J. Smith Young YMCA’s brand-new event space, 119 West Third, will be the Shoppes of Holiday House. Like several other homes located in what is now known as the Park Place Historic District in Uptown Lexington, Clark’s was built using the plans of Atlanta-based architect, Leila Ross Wilburn in the early 1920s. One thing Clark wants to be visible amidst the holiday décor is his own careful blend of contemporary and antique style. Though he’s excited to show off pieces like a framed mirror in his living room that was reclaimed from one of the home’s original medicine cabinets, Clark is adamant that people who visit the Holiday House take note of the fact that it isn’t a museum. In spite of the unusual circumstance of hundreds of strangers viewing his private life, Clark is attracted to the idea of supporting an organization with a long history of helping the community. Ralph and Mary Allison Bailey were the first to open their home to the public to support the Charity League’s mission. The Holiday House wasn’t the first fundraiser the league had put on since it was founded by a group of good-hearted, card-playing women in 1935, but it stuck. Strader, a Lexington transplant from Greenville, SC said the first event brought in a little over $400. Nowadays the fundraiser brings in between $6,000 and $10,000 annually in ticket sales. That doesn’t include the revenue from the Holiday House Shoppes, which can approach $11,000 in a good year. The Shoppes are a sister fundraiser based on the original bazaar-style event hosted by the Charity League that fell to the wayside in the mid-1980s. Members contribute projects, crafts, and pre-prepared food items to be sold alongside items from outside vendors. Welborn said most visitors to the Holiday House have been coming for years. Brenda Houser, who is serving as co-chair of the Holiday House this year along with Christa Weeks, said the makeup of visitors is usually a good mix of people from Lexington and surrounding areas. One of Turlington’s most memorable Holiday House experiences was in 1999 when the then-home of Ed and Peggy Hinkle was featured. Again this year, people from across the Triad will visit Novant Health Thomasville Medical Center to celebrate the holidays as businesses and civic organizations decorate trees for a month long display. Then, as it has for more than a decade, TMC’s lobby transforms into a festive winter wonderland with the lighting of the annual Christmas Trees of Davidson County. The lobby is open for visitors to enjoy daily from 6:30 a.m. – 9:00 p.m.
Thomasville Medical Center has become a favorite holiday gathering place for the community. Each tree is uniquely decorated and has a story of its own. There is no cost to a business or civic group to participate. Some organizations donate the decorated tree to the foundation which accepts bids through a silent auction on the trees throughout the month. The lucky winner then purchases a beautifully decorated holiday tree with proceeds benefiting the foundation. Reece shares that money from this year’s auction is earmarked for the hospital’s growing oncology program, providing patients in financial need who are being treated for cancer with nutritional supplements and an exercise program to aid recovery. Proceeds will also be used to help launch rehabilitative support for patients newly diagnosed with breast cancer. “We want people to view the hospital as a place of wellness, and hosting something that brings people to the hospital for no other reason than to view the trees and celebrate the holidays is a great opportunity,” says Reece. Throughout the month are a variety of activities going on in the lobby as well. Visitors can enjoy carolers from an area church or daycare, employees singing around the piano, and samples of hot cider or cocoa. Visitors come by car, bus and caravan, and many families use the festive scenery as a backdrop for their annual holiday card to friend and families. Welcome to the hustle and bustle of the rat race during the holidays. Focusing can be hard to do with so much to do this time of year. Sure, the holidays can be a stressful time, but for many, it’s one of the most enjoyable times of the year. Family that you don’t get to see that often makes a visit; memories are made and stories are shared. This start to finish guide will make it a foolproof holiday for anyone. Starting with aromatics, moving on to a holiday meal and finishing it off with a vivid tablescape, this guide will help you do it all without the stress. Aromatics have a way to lock places and times into memory. Have you ever walked past someone and smelled cologne or perfume that reminded you of someone special or a place you visited? Here’s how you can lock special memories into your loved ones’ minds this year. Nothing says, “Welcome home” better than the smell of oranges simmering with spices on the stove. Make your home memorable by warming this recipe on the stove or in a crock pot for a continuous smell of “wonderful.” The refreshing citrus of the oranges combines with the comforting warmth and spice of cinnamon, clove and other spices. 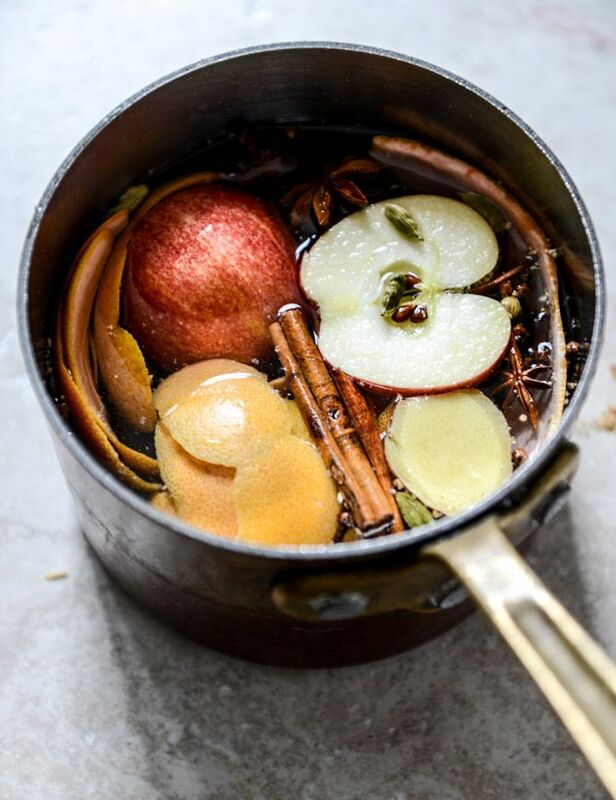 Using this simple “stew” is a wonderful way to welcome guests into your home during the holidays or anytime throughout the year. Simply remove the peel (as little white as possible) from two oranges. Put those in the little crock pot or sauce pan along with a palmful of whole cloves, whole allspice, and three or four cinnamon sticks. Cover with water and plug in the crock pot or turn the stove on to warm and let the smell work its magic! Yum! A simply delicious holiday meal can be fixed without a lot of work. The holidays are about the time spent with loved ones versus the time it took you in the kitchen. With this meal plan, you’ll spend more time sharing laughs than stewing in the kitchen. In a jar or plastic container with a tight lid, combine the dressing ingredients: olive oil, orange juice, balsamic vinegar, garlic, salt, pepper, and crushed red pepper. Shake until well incorporated. Slice the orange, removing the membrane portion of the orange. If time is an issue, you can always substitute mandarin oranges. Halve the red onion. Cut the half in half then slice thinly. Slice the olives in half. In a medium bowl, combine the oranges, red onion, and olives. Right before serving, pour on as much of the dressing as you prefer. To prepare the stuffing, melt the butter in a large frying pan over a medium high heat. Once the butter is melted, add bacon and cook for 3-4 minutes. Add in the onions and cook for a further 4-6 minutes until the onions are soft. Add the apple and cook for 3 minutes. Remove from heat and stir in breadcrumbs, orange zest. Season the mixture with sea salt and ground black pepper. Allow to cool before covering and storing in the fridge until you are ready to use it. Preheat the oven to 375 degrees. 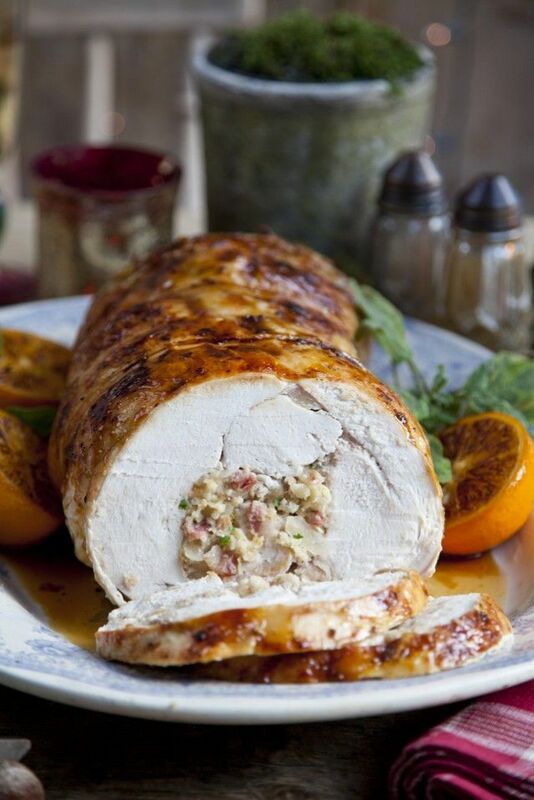 Unroll the turkey or turkey breast and add stuffing mixture to center. Tie off with string to keep together and place in a large roasting pan. Rub with butter and season generously with sea salt and ground black pepper. Roast the turkey for approximately 2 ½ hours or until a meat thermometer reads 150˚F. If the skin is looking too brown, just cover with tin foil. Whisk together the orange juice and maple syrup and pour a little over the turkey every now and then to baste. saving half the mix to add to the gravy. Remove the turkey from the oven and brush with maple syrup and place back in the oven for about 20 minutes more or until a meat thermometer reads 160˚F. Remove from oven and let rest 10-15 minutes before cutting. Scrape the juices from the bottom of the roasting tin into a small sauce pan along with the remaining maple syrup and orange juice and bring to a steady simmer until it reduces a little. Use remaining juice/gravy as side to turkey. Enjoy! In medium saucepan, sauté onion and garlic in olive oil until translucent. Place in the bottom of crock pot. Add greens to crock pot. Special note: If greens will not fit, you can do a quick sauté to wilt them so they will fit, but don’t overcook them during this special step. Add ham hock, red pepper flakes, salt, pepper and water. Cook on low for 6 hours or more if preferred. Greens will come out perfectly seasoned and taste great! Preheat oven to 400 degrees. Line cookie sheet with parchment paper or spray with cooking spray. Unroll pie crusts and press each into 10 1/2” square. Brush with melted butter. Place cranberries, pecans, sugar, cinnamon and orange peel in food processor. Pulse until finely chopped. Spread half of mixture on each pie crust square. 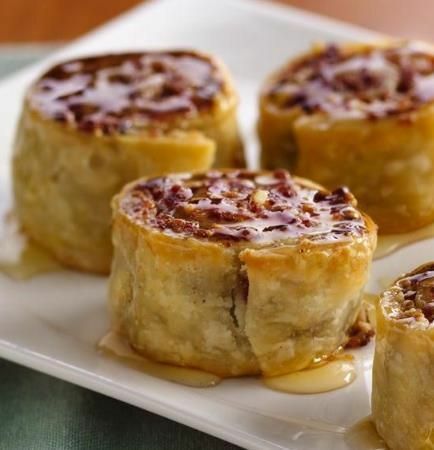 Roll up each pie crust into a log. Pinch edges tightly to seal. In small bowl, beat egg and water until blended. Brush egg mixture over each log. Cut each log into 10 slices. Place slices cut side up one inch apart on cookie sheet. Replace any dropped filling and reshape slices if necessary. Bake 12 to 15 minutes or until golden brown. Remove pinwheels and place on cooling rack. Spoon a teaspoon of honey on each slice. Serve warm or cool. The key to a great table is an inviting one. 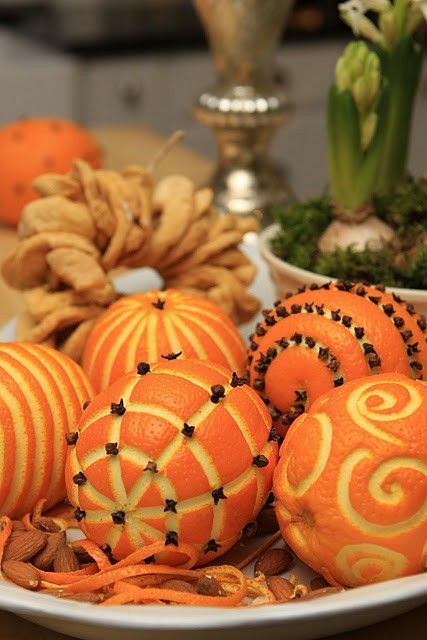 Make your table pop with a few of these festive ideas sure to welcome guests all season long. Wash and dry oranges. The number of oranges depends on the size of the table and size of the dish you wish to use to hold them. A great suggestion is to use a minimum of three oranges per dish for even the smallest of tables. To dry the centerpieces, place them in a paper bag for a few days to weeks. The bag will draw out the juice and the oranges will shrink in size. If you choose this method to keep the centerpiece for a long time, make sure to watch out for mold during the drying process. Discard any that generate mold. Add to a dish with green pine needles and pine cones that you’ve gathered form outside. You can accent with magnolia leaves as well. Use what you have from your yard to keep the cost of these beautiful centerpieces affordable. Now it’s time to sit down and enjoy the time with family and friends. From our holiday table to yours, Happy Holidays! It’s time to vote for your Focus Favorite Places to Dine, Shop and Socialize in and around Davidson County. This is your chance to support your favorite local places to visit and vote them #1! One entry ballot will be selected as the Focus Favorites reader winner and will receive a Focus Magazine Focus Favorites Prize Pack! Remember, you’re supporting the locally owned businesses around our community. Good luck to everyone! Results will be published in the Spring 2015 edition. One ballot entry per person. Deadline for entries is January 31, 2015. Submitting more than one ballot entry per person will result in removal from contest and ineligibility. Only one winner per household. All prizes must be claimed at 200 Radio Drive Lexington, NC 27292 unless told otherwise. All prizes must be picked up within 30 working days from date of winning. Employees of Davidson County Broadcasting, Inc., participating sponsors, including their immediate families, members of any North Carolina Radio Station or Print publication, Newspaper, Magazines, or TV Stations are ineligible to win.